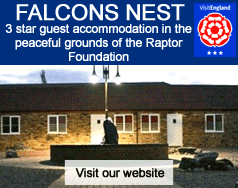 The Raptor Foundation has always been committed to contributing to the conservation of birds of prey and biodiversity both at home and abroad. Around the world falconry has sometimes been at odds with conservation goals. Historically, many raptors have been taken from the wild. However, falconry is now strictly regulated and falconers have become pioneers in developing conservation strategies and fighting for legislation to preserve wild birds of prey. Falconry centers play an important role in conserving wild populations. Captive individuals provide an insurance policy against wild species extinctions and they can contribute towards maintaining viable wild populations by captive breeding programs. We are proud to play a part of the continuing conservation of raptors that has allowed several of our native British species to recover from near extinction. Primarily the centre functions to educate the public about birds of prey and raise awareness of these beautiful animals, their fascinating lifestyles and the problems they are facing in their natural habitats. In doing this, the plight of birds of prey becomes more important to the general public and therefore the government and more resources can become available for conservation management and preventing persecution of wild birds. We hope that as you go around the centre you will take an interest in the conservation of raptor species and perhaps be inspired to get involved yourself. Our veterinary facilities and expertise allow us to take in injured birds with the aim of returning them to the wild. Early in the year we also get many abandoned chicks brought in to us by the public. This year we have successfully hacked back (allowed to fly freely) and released injured kestrels, barn owls, tawny owls and little owls that came to us as abandoned youngsters. Unfortunately, not all birds can be returned to their natural habitat. All birds that are released from the centre are tagged with a unique identification ring that allows wild populations of birds to be monitored by conservation researchers. We work closely with the British Trust for Ornithology and local farmers in coordinating the release of birds back into suitable habitats to increase their chances of survival. Habitat loss is swiftly taking over from direct persecution as the dominant threat to birds of prey. Agricultural and urban expansion has reduced the prey and nesting sites available. In order to preserve our raptor species, or in fact any aspect of British wildlife, the whole environment needs to be protected. This new approach to conserving biodiversity (the variety of life in all forms) emphasizes the importance of healthy ecosystems for long term persistence of species. Throughout the development of the centre, British biodiversity has been considered. By planting a wide variety of trees, shrubs and flowers and encouraging our wildlife pond, our site now provides habitat for other wildlife including birds, small mammals, frogs, toads, insects, butterflies and moths. As a result we have many wild birds of prey that hunt and nest in the local area. By planting a small forest of native British trees around the edges of the flying area and car park we also hope to contribute towards counteracting the carbon emissions used by your cars when you come to visit us. Further afield, we work with the World Land Trust (in association with BIAZA) in extending a reserve in the Atlantic forests of Brazil, one of the worlds most endangered habitats. The new BIAZA Reserve will be an extension of the existing Reserva Ecologica de Guapi Açu (REGUA), approximately 80km North-East of Rio de Janeiro. The reserve covers an area of around 15000 acres of highland rainforest & lowland wetlands, in the past much of these habitats have been destroyed by logging & draining the wetlands to provide pasture. The Atlantic Forest, or Mata Atlantica, is considered one of the world’s top biodiversity hotspots. Unfortunately, it is one of the most critically endangered ecosystems in the world mainly due to severe habitat destruction. The region is known to be home to 55 species of mammal and over 440 species of bird. Specifically of concern to the Raptor Foundation, the area is home to 53 species of diurnal raptor & 14 species of owl. Some of these 67 species of raptor are endangered, whilst others are being forced out of the area due to habitat destruction. REGUA is actively restoring the reserve to its former condition, recreating the wetland areas & restoring former vegetation types and also reforesting areas of forest that have been cleared. If you want anymore information about conservation at the Raptor Foundation feel free to contact us or talk to a member of staff during your visit.